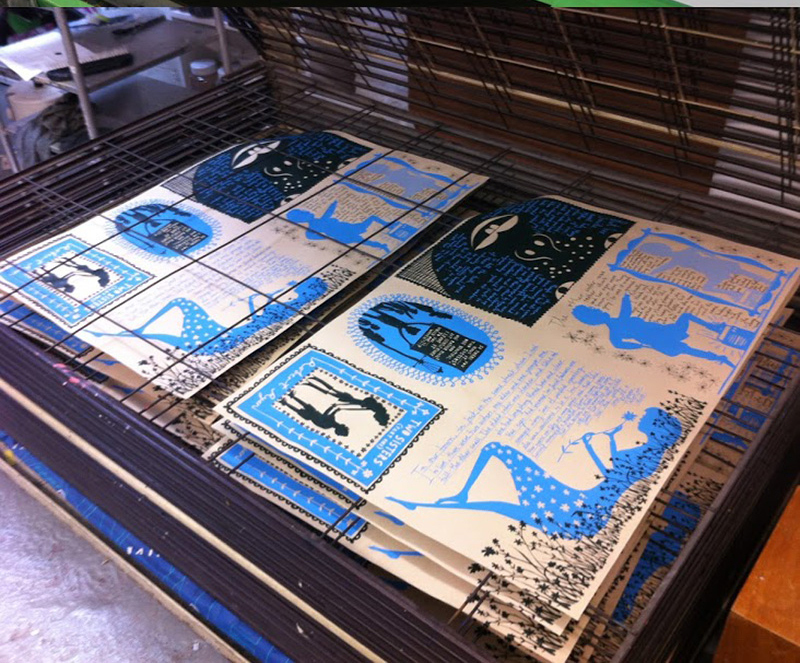 Rob Ryan is an internationally renowned East London based screen print artist and designer. He was born in Akrotiri, Cyprus, in 1962. His best known works comprise of highly intricate decorative paper cut-outs that include words and images of figures in idyllic environments, and words that describe feelings of love, happiness and hope. These paper cut outs have been seen in their original state in galleries, and have also been screen-printed on to homewares, used as the backdrop of a Liberty shop-window, and decorated T-shirts, jewellery and calendars. 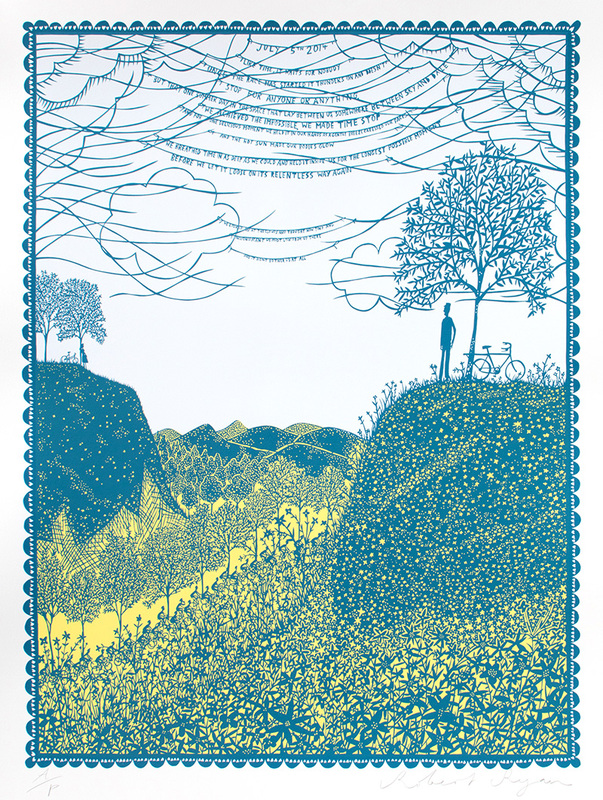 In fact, think of an object and you can probably buy one decorated by Rob Ryan! Rob has a team of incredibly talented and dedicated craftspeople that help to make these ideas a reality. Tom Camp is Rob’s screen-printer (as well as an artist/illustrator in his own right). 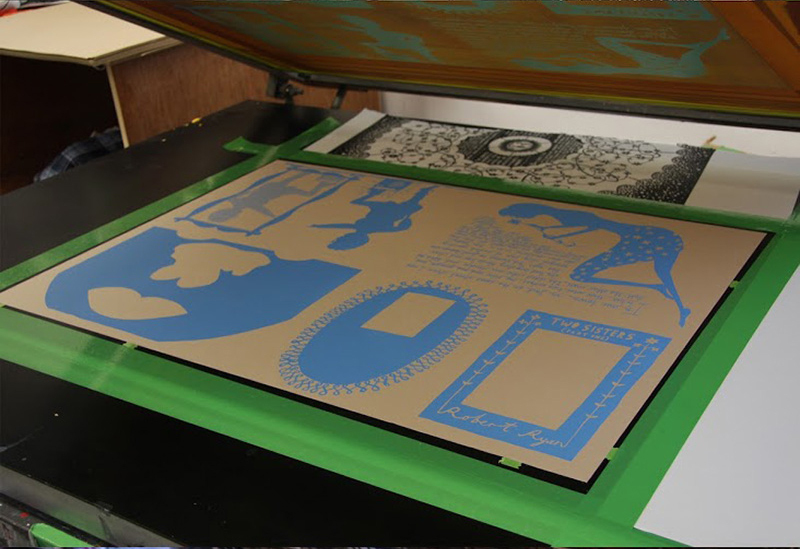 He took time out to tell us what it is like to help create a Rob Ryan screenprint. 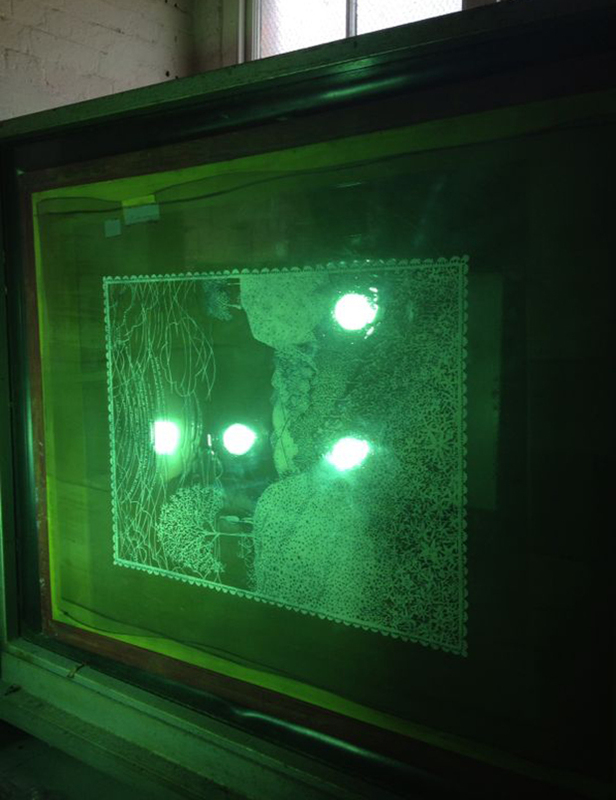 The photosensitive exposure unit: The spray painted paper cut out is positioned on the silk screen which has been coated with a light sensitive photo emulsion. When the UV is exposed, the paper cut out will block out the coating. When Tom rinses the screen the emulsion will block out the screen where there were spaces in the paper cut out, meaning that ink will only pass through the silkscreen where the paper cut out allows it to. The first step of turning Rob’s drawings into a screen print is to create a paper cut. Rob will draw onto a large sheet of paper and instruct us on what to cut out and what not to. Generally the cutting out is Louise and Michelle’s forte. After a fair few hours and lots of fresh scalpel blades the paper cut is finished. It is in quite a fragile state so to strengthen it and give it a bold colour, we then carefully spray paint it, generally outside if the weather permits. Rob decides which colour would be suited best to each paper cut in advance. Spraying it also helps me to use it as the positive when exposing it onto a screen, as the paint prevents the light shining through the paper. The screens are coated with a photosensitive emulsion, which reacts with UV light. When the light shines against the screen, the paper cut blocks out what I want to print and after exposing it for around 10 minutes I wash the screen with water and the shape of the paper cut washes out. Using the paper cut as the positive is brilliant because you get the handmade look and feel in the screen, something that a digital version of the image wouldn’t give you. Once the paper cut is on screen, I’ll then have a chat with Rob about how many layers he wants to use and we discuss colour choices. 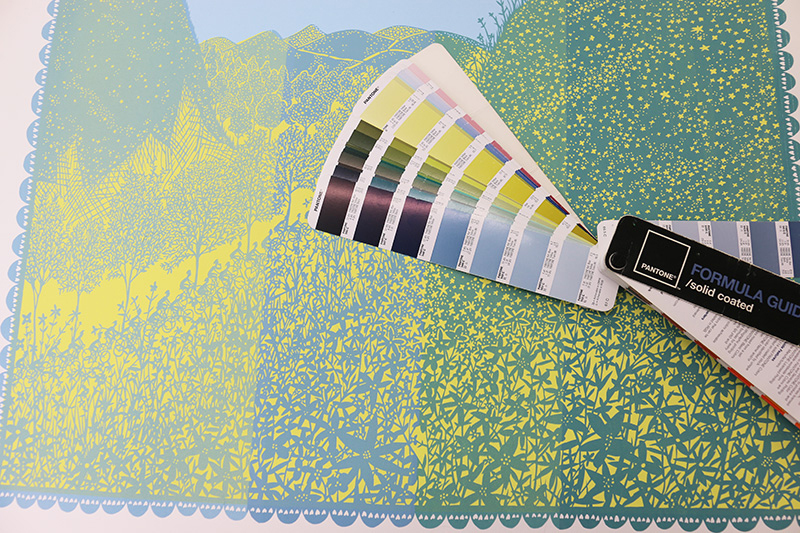 I then go back to the print studio and mix up the chosen colours and get on with sampling the print. This is my favourite part of my job as I get to mix and match loads of different colour ways that will never be seen by anyone else outside the studio. Once I’ve printed these samples I take them over to show Rob and everyone in the studio. We all have a chat about what works best and then we’ll all make a decision together but obviously Rob has the final say! At this point if there is a clear favourite choice the sample will be signed off and I can start printing the edition. However sometimes I have gone back three or four times with different changes, it’s the most important stage because the colour choice can change the whole feel of the print. After I’ve been given the go ahead with the colours I’ll then reset the print bed, give it all good clean to make sure the paper won’t get dirty while printing. Mix up the right amount of ink to finish the print job and once the screen is set up and registered it’s time to print. Firstly I’ll put a piece of paper underneath the screen. Then put a generous amount of ink on the screen, enough to cover the printable area. With a squeegee, I’ll flood the ink across the screen this pushes ink into the mesh of the screen. I’ll then pull the squeegee towards me, making contact with the paper underneath which makes the reproduction of the image onto the paper. Depending on the size of the print and the edition size, sometimes I’ll have help with racking the prints after each pull. The time frame can change too, as large editions obviously can take more than one day, especially with multiple colours. After all the printing is done, they are then left to dry over night. This gives them time to flatten out and so the paper doesn’t warp. Once the edition and proofs are complete myself or one of the team will check through all of the prints to make sure there are no imperfections and to make sure the correct number have been printed for the edition and proofs. Once this is done, Rob signs the prints. A selection of prints by Rob Ryan will be on show at the TAG Fine Arts stand (stand 37) at the London Original Print Fair which runs from Thursday 24th – Sunday 27th April at the Royal Academy of Arts, Piccadilly, London. 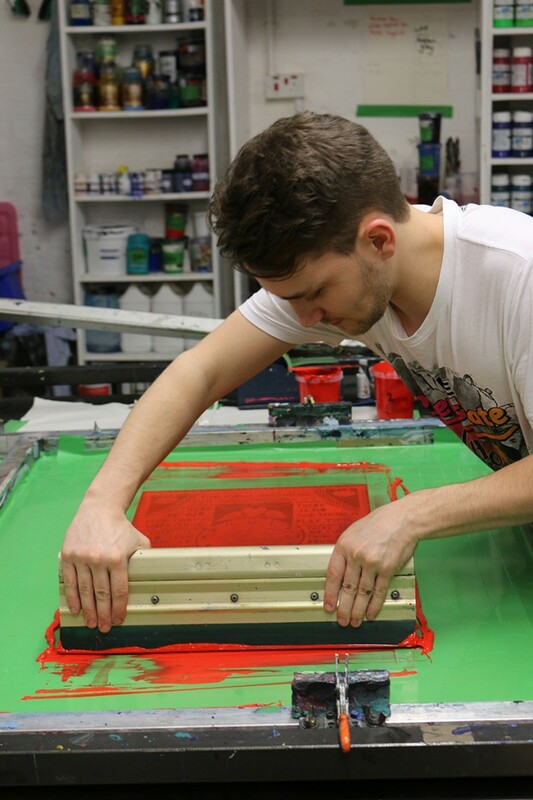 Fancy having a go at silk screen printing yourself? 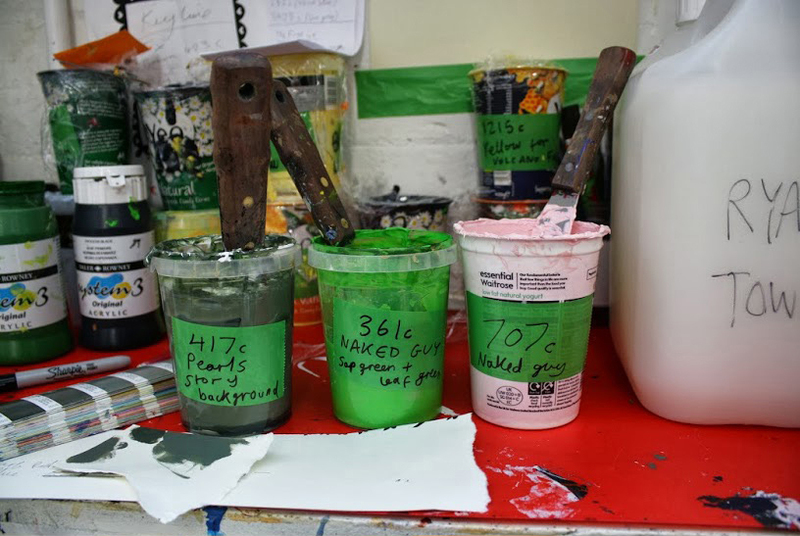 The Jackson’s Art Supplies Screenprinting department is online here!